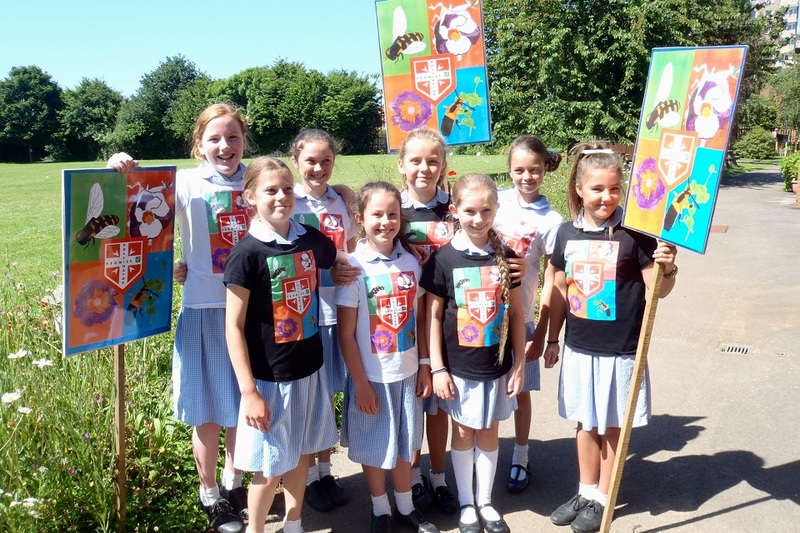 A group of Year 4, 5 and 6 pupils from St Alban’s Primary School in Hampshire have been campaigning to improve biodiversity in their local community as part of the Polli:Nation ‘Art with a Message’ competition. The team of pupils drummed up support for their ‘Pollinator Promise’ campaign by inviting other pupils, parents, teachers and members of their local community to pledge to help improve biodiversity. Each was asked to dedicate a one metre by one metre area in their outside space where they would grow plants and crops that specifically provided food and shelter for friendly garden pollinators. The pupils even offered out seeds they had harvested from their school garden and plants grown from seed, to encourage others to get growing. The schools adopts a buddy system in the garden allowing the older children to mentor and support the younger children and pass on their skills. Throughout the project the children were able to develop their social and communication skills and learn how to work as a team. The children, along with the staff and parents, gained an increased awareness of the importance of plants for pollinators and together the community has started to bring more colour to local gardens, churches and businesses. As part of the campaign, the team put together a short video to showcase their work and encourage other schools to do something similar. Polli:Nation is a Heritage Lottery funded biodiversity and education project which invites schools and groups to learn more about pollinators while supplying important data to the ongoing scientific research being carried out by OPAL (Open Air Laboratories). Take part in the survey and help support our nation’s pollinators. Use this Pollinating Insects Spotter Guide to teach pupils the different types of friendly insects that help pollinate our plants such as hoverflies, honey bees and soldier beetles. Our Blooming Biodiversity project is perfect for teaching older students about local ecosystems, biodiversity and interdependence. Encourage more friendly bugs into your garden buy building a Bug Hotel.